Buenos Aires is the biggest and most populous province of Argentina. Since the 1880s Buenos Aires is an autonomous city, and the capital of the province is La Plata. 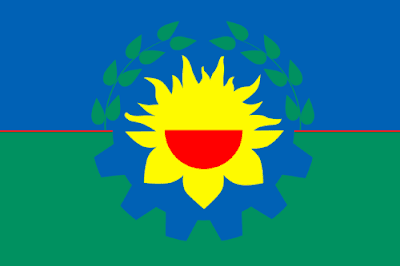 After a request by reader Bruno Rodolfo, I decided to make a new flag for the province, with more references to provincial history. It was adopted in the 1990s. I think the design has some merits, but the color clash is problematic. The diagonal layout remembers the map of the province. 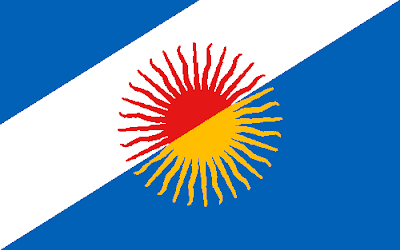 The medium blue fields represent the sky — "buenos aires" means "good airs" in Spanish — and the sea, respectively. The white stripe is not only a nod to Argentinean flag, but a reference to Plata river — "plata" is Spanish for "silver —, fundamental for the development of the province and the whole Argentina. The golden color represents province's wealth, and the red demi-sun is a symbol of federalism and appeared in earlier Buenos Aires flags. Many thanks for reader Bruno Rodolfo, for his valuable theme suggestion. 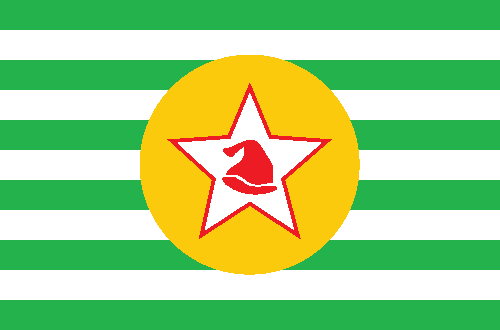 A commenter called Bruno Rodolfo asked about designs for a new Paraíba state flag. 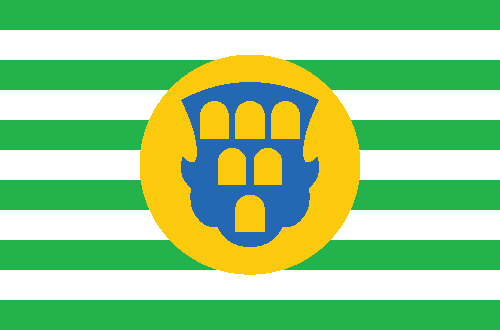 When I had a series for new Brazilian flags, I argued that Paraíba hasn't one of the best flag designs, but I'd keep it for its important link to history. However, this link to history is being strongly desconstructed last years. It was adopted in 1930 to mourn the murder of João Pessoa, then-governor of Paraíba and running candidate for vice-president of Brazil. 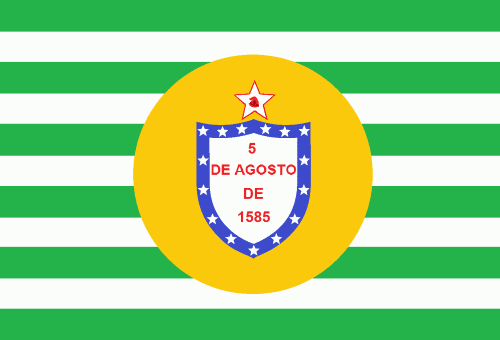 For similar reasons, the state capital was also renamed "João Pessoa". 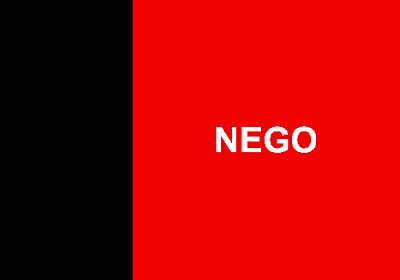 Many argue against the flag currently, because: it represents only negative feelings; the murder had more passional than political reasons; his death was catalyst for a coup d'etat that gave birth to dictatorship. 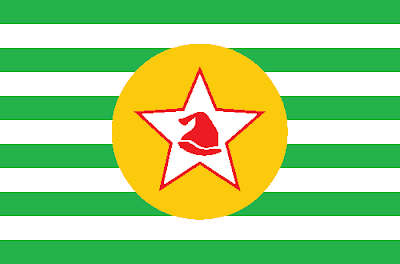 The second design is symmetrical, simple, apolitical and has all the colors of national flag. The coat of arms supposedly contains six sugar breads, representing the historical importance of sugarcane in state economy. Bonus: a tongue-in-cheek design I once design, just to prove a point. 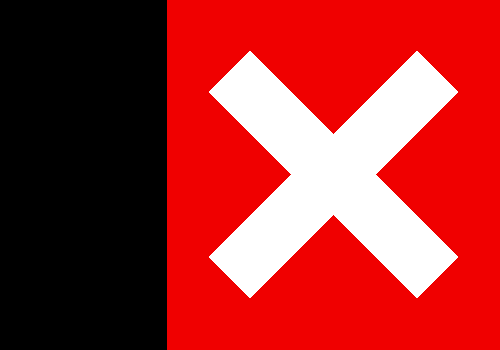 Hint: the text in current flag reads "I DENY" in Portuguese, even though current ortography is identical to a N-word. It wasn't made for serious purposes, but still better than current design. I'd link to thank Bruno Rodolfo for his precious suggestion.